Developing skills for leaders and team players is an investment – in your Organisation’s future. Run over 3 – 5 days (depending on your need), our popular Leaders Retreat Programs focus on simple, yet effective leadership theory, experiential activities, key principles and guiding factors to create leaders (out of existing leaders and emerging leaders) to drive your business forward. Because we customise the Retreat Program to suit your needs, no two Retreats are ever the same, but each delivers the outcomes that it is designed to do, based on what outcomes you want. Our Leaders Retreats enable the kind of breakthrough moments that are hard to engineer at big conferences, or at work. They do not follow the formality of a presentation or conference agenda, (although we have content to cover) but there is a great focus on self-insight, personal and professional growth and well-being and creating (or sustaining) strong workplace relationships so participants have a chance to step back from day-to-day problem-solving and think about larger goals. 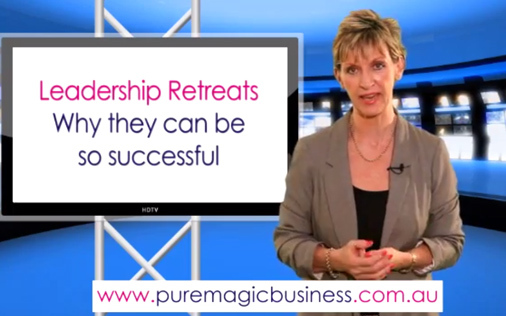 Which is why our Leaders Retreats are popular and productive! We have been running Carers Retreats for 17 years and are well known for providing fantastic relaxing, informative and educational Retreats for Carers, which is why we run so many Retreats for a range of different Organisations. Specifically focussing on providing Carers with key skills and strategies to use in their caring role and to allow them to relax a little and form strong social relationships for the future, our Retreats are highly acclaimed at being the best there is. We teach Carers strategies and techniques to be resilient, manage daily stress, focus on goals they would like to achieve and learn how to manage work-life balance, amongst other topics. If you would like us to host a Carers Retreat for you, contact us without delay. If you like, you can do what countless others clients do. Follow up the Retreat with 4 one-day post-Retreat workshops spread over four months to build on the teaching at the Retreat and further solidify relationships formed at the Retreats. How experienced are the trainer(s)?